At Jacobs Law Group, PC, we understand business. Attorney Neal A. Jacobs founded the firm in Philadelphia, Pennsylvania, as a fresh alternative for businesses seeking legal help. In contrast to large, impersonal law firms that target only top-tier corporations, Jacobs Law Group is a boutique business and commercial law practice focused on middle-market companies and entrepreneurs. We combine practical advice with intelligent legal counsel. 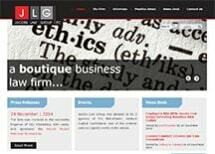 As business attorneys, we understand the business realities clients face. Our holistic approach is rooted in a deep understanding of how our clients operate. By balancing legal and business concerns, we tailor solutions to fit clients' needs. The firm offers guidance on the broad range of legal issues that businesses encounter, including niche areas such as business divorce and shareholder relations. Founding attorney Neal Jacobs is a pioneer in these fields. The entire legal team at Jacobs Law Group stands on a strong record of professional success in business and commercial law. Many have been chosen as Super Lawyers and distinguished as AV Preeminent peer-review rated,* the highest rating through Martindale-Hubbell. The firm is also a three-time winner of the Philadelphia 100 Awards. Above all, we share a commitment to thoughtful client service. This individualized approach has served as the foundation for the firm's 15-plus-year legacy. To speak with our lawyers about your business objectives and legal needs, please call 215-569-9701. Your initial consultation is free of charge.